I have a very extensive craft library in my craft room, but there are a few books that stand out as the very best. The Complete Guide to Needlework by Reader's Digest is by far the very best craft reference book I own. I refer to it more often than any other book in my library. Actually, I use the book for reference, but anyone who wanted to learn basic techniques in embroidery, smocking, quilting, needlepoint, knitting, crochet, tatting, or just about any other needlework technique, will find excellent "how-to" guides for beginners in this book. 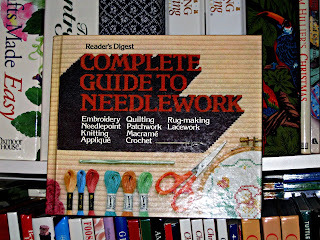 Reader's Digest COMPLETE GUIDE TO NEEDLEWORKI know this book was published in 1979, but it is far from outdated. Basic needlework techniques don't change with time. As a matter of fact, we need these types of instructional books to ensure the techniques won't be lost in time. Because I enjoy all of these crafts, I tend to set one aside for a while and pick up another. Eventually, I go back to the first one and I need to refresh my memory on certain stitches or even reading a pattern. I pull this book off the shelf, look it up and, voilà, I am ready to stitch again! For example, I recently came across "featherstitch" in an embroidery pattern. I sat staring into space as if the vision of how to make that stitch would miraculously appear before my eyes. It only "miraculously appeared" when I pulled my Complete Guide to Needlework down and looked it up. On page 214, I found exactly what I needed. A verbal description as well as excellent illustrations. I have also found that I tend to forget certain crochet pattern abbreviations if I have not used them in a while. For those of you who crochet, you will laugh when I tell you I recently had to look up what "dec" meant on a pattern. Yes, I was embarrassed when my trusty book gave me the answer, but amazingly, the pages didn't laugh at me. Another crocheter would have laughed with reckless abandon. There are also some wonderful patterns in the Complete Guide to Needlework by Reader's Digest. I tend to forget that those are there. 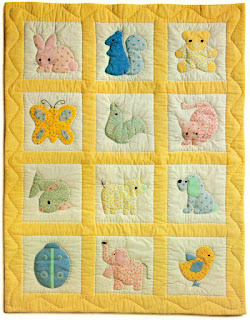 While flipping through the book today, I came across this awesome pattern for a baby quilt appliqued with baby animals. The pattern includes the drawn animals and gives the instructions on how to enlarge the animals on a grid. I love the detail! It is so wonderful to have a step by step tutorial with the pattern. This particular pattern uses several needlework techniques to complete the baby quilt as shown. Applique, quilting and embroidery are all a part of this fabulous piece, but you could make the quilt based on your own skill level. Leave off the quilting and the embroidery to simplify it. It would be an excellent way to learn how to enlarge the pattern with a grid and make a lovely applique baby quilt that would be forever treasured. There are patterns for many of the needlework techniques. It truly is a "complete" guide to needlework! I have two similar how-to books, Mouse, related to crafting which go back to late 1960s/early 1970s that have been a necessary part of my crafting library ever since I acquired them. You are right - if you do multiple crafts and there is a period of time between applying one of the techniques, there are little things (a certain stitch, etc.) that one tends to forget. Having craft reference books is a 'must have' part of any crafter's library. Excellent review of your Complete Guide to Needlework. This Reader's Digest reference looks so very familiar and I'm wondering if I might have owned the book at one time. If I still did needlework, I'd certainly add the book to my library now. Looks like not only a great reference but a great inspiration for those who are happiest with a crafting needle or hook in their hands! Oh Miss Cynthia, I have this book and agree with you totally. This is a MUST HAVE resource guide for even the most experienced needleworker. So many ideas are born by looking through the pages and kindling that fire to create. Thanks for a great review. I'm not into crafts or needlework, but I do have several similar books published by Readers Digest. The one I bought on sewing is the best reference on sewing I ever had. I was a complete novice. My mom tried to teach me and she helped me get through making the required apron in Home Economics in junior high, but sewing was always difficult for me. When I got married I wanted to try again with simple patterns. I bought an early edition of Reader's Digest Complete Guide to Sewing and it helped me solve many a problem. The illustrations helped so much more than just words, though there were also words to explain them. We bought many other books in this series. I remember one is on home repairs and we consulted it when we needed to fix something. We also bought Back to Basics and the Complete Book of Gardening -- both with a similar illustrated format. I'd recommend these books to anyone. I have had this book for years! I think I got it when it was first published in 1979. It is one that I refer to often and I think anyone who does needlework should have it in their library. I have always admired embroidery but could never figure it out. So glad that you have such a helpful reference. I have tried some very simple quilting and can't wait for the day that I have more time to sit and practice that skill. Reading this review makes me wish I had kept up with my early needlework interests. I love this kind of guidebook. I'll keep it in mind should I pick up my yarn and needles again. Thanks for a great resource. Love the baby quilt. Needlework is truly fantastic, I find I can't get enough of looking at or especially owning this type of DIY. We have needlework in our home (completed by my mom), so many handmade baby clothes saved, blankets and more. They mean so much. I've never tried needlework, but am really getting the itch to give this a go. I have this book too and it is a treasure. I like every kind of needlework so it's great to have as a reference, like you said.